If you were invited to an evening party, which outfit would you choose: a tailored dress individually sewn for you for this particular occasion, or a dress which you bought in a shop and which might be worn by someone else at the party? I’m sure there is no second opinion about it. The same goes for other things in life, language learning including. No doubt, we do need standards that structure our life and against which we could measure our success and growth, or whatever. However, we are all unique and perceive and react to the world in a different ways. We process and analyze information differently. That’s why standardization in education bears little fruit. So it’s not surprising that personalization and customization have become the burning issue in modern ELT discussions. The necessity of personalized learning is agreed upon by the majority of educators around the world. This means that within existing and preferably revised from time to time educational standards, teachers should strive to achieve personalization as much as possible, i.e. to make teaching meet the expectations and interests of learners. Regardless of the seeming drawbacks of personalization such as the lack of general perspective; unclear time span of a course; blurred syllabus and lesson structures; easily lost purpose of learning and an obscure outcome; the overdependence on a particular teacher’s techniques and preferences; and, more importantly, the avalanche of online and paper resources, customization of the learning process has a lot of strong points. Foremost, personalization addresses learners’ unique needs and expectations. Students are working on their own mistakes and weak points; they study and practice the vocabulary and functional language they need for achieving their own personal or professional goals; they read about and discuss the topics relevant to them. Moreover, learners have the opportunity to work in the way that is most appropriate and convenient to them. For example, some learners need more of grammar drills while others find drills stultifying and prefer more dynamic and creative tasks. With the advent of technology and its integration into the classroom, personalization has become even more easily achieved. Social networking systems, podcasts, wikis, bogs, encyclopedias, online dictionaries, webinars, online English courses, various applications, to name but the few, can satisfy the most capricious and picky learners. And though the shocking number of online resources can at first intimidate a learner, this frustration can be overcome with the attentive guidance of a teacher who will give expert advice to the learner on how to steer through online ocean and find the treasure islands. Unfortunately, this hi-tech paradise is not accessible to the majority of English learners around the globe. I regret to say that Russia is not an exception. In addition to the use of mainly out-dated and tedious course books, there is almost no personalization of the learning process neither at schools, colleges, universities nor even at language courses. But if some attempts of personalizing lessons do occur, it is solely the initiative of some individual teachers. Below I am going to list some solutions to the above question. These things or techniques are no way new to ELT but we just sometimes need to be reminded of some old good but long-forgotten or taken for granted techniques which can serve us a good service in solving new problems. The first and foremost thing to do at the very beginning of a course is to carry out a rigorous needs analysis and overall general English test. It will also be beneficial to identify students’ learning styles and teaching methods they are used to. I find it very fruitful to question students about their course expectations and then hold a group discussion on this topic. The finishing touch to getting to know your students is to conduct some psychological tests to reveal what sort of personalities your students have and what kind of people you will have to deal with later. Secondly, make sure you try out various types of activities ranging from old-fashioned dictations to modern Web 2.0 tools, if, of course, it is possible in your teaching environment. In this way you will enlarge students’ arsenal of learning techniques and will address expectations of the majority of your students. Moreover, if your students find some types of activities most useful and appropriate to them – congratulations! – you have hit the bull’s-eye. In this case, try to include these activities as much as possible in your lesson plans. This is exactly what happened to me when I was teaching an elementary group of adults at a language school. As it is always the case at most language schools, I was under pressure to cover the whole course book by deadline. So we were mainly doing the textbook exercises during our lessons with the very few extra materials of mine. Somewhere at the end of the course book there was a listening dictation exercise: students had to listen to the whole sentences and then write them down. To my surprise, all the students in the group were excited about the task and were eager to do more exercises of this kind. Unfortunately, it was almost the end of our course and we never did such exercises again. But this case taught me a good lesson: teachers are not necessarily need to run headlong after ever-growing number of countless hi-tech educational tools but rather creatively exploit some traditional yet useful techniques. The case with my elementary group also showed me that a teacher should always be mindful of their students’ preferences and needs. This is how personalization can be achieved no matter whether you have to cover a course book in a limited time period or working one-to-one, whether your classroom is hi- or low-tech. Thirdly, there is no better tool to personalize learning than to give floor to the students, let them decide on the contents of the lessons, choose the activities they like the most, make them active participants of their own learning. This way works both for group and individual teaching. It is no secret that to do all these is highly time- and energy-consuming. From a teacher, it requires good people and observational skills, the ability to reflect and analyze. Teachers should always be tuned in, flexible and responsive to changes in their classroom. They should be able to single out students’ linguistic problems and address them accordingly. Finally, there is one more thing, the crucial one, that makes personalization possible in any learning environment. This is a teacher’s personality: the willingness to help and surpr@ise (© Vladimira Chalyova) your students, open-mindedness, patience, love for their profession, eagerness to try out new techniques and experiment with the old ones, and a strong feeling of responsibility. 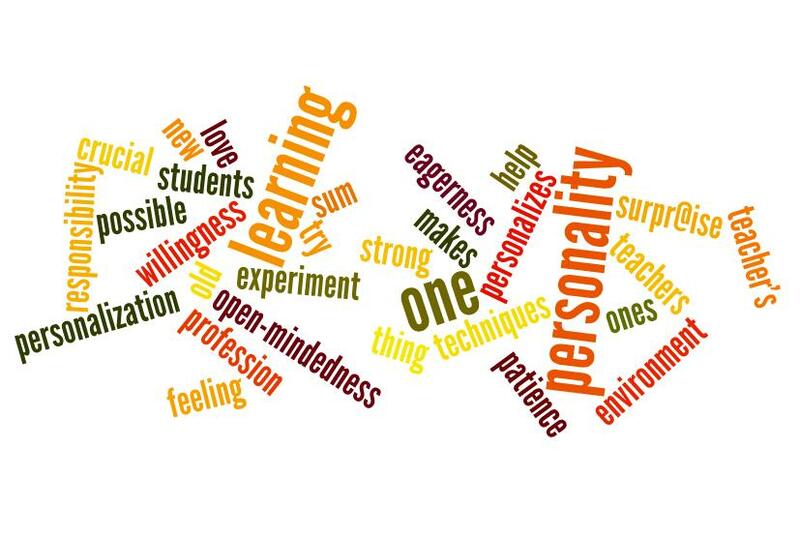 To sum up, it is teachers’ personality that personalizes learning. I can’t agree more! Standards come and go, they can never be perfect. Only the teacher’s and students’ personalities are being perfected at the moment of socializing. It’s a family of people maturing togeather. The language will come alongside this magic process. But without it the language just doesn’t exists, it turns into a dead unused set of rules. You’ve hit the target! Follow this way and you’ll be happy of never having to work as all your life will be communicating in English with students or with the whole world. Thanks for your warm words, Olga! Work is a large part of life of most of us. Most people take it as a tedious but unavoidable necessity: they serve their “sentence” every day desperately waiting for 6pm when they actually strart to live. No doubt, with the attitude like this, there is little joy and happiness in life. So the key to a happy living is to make our work enjoyable and creative, and accept our work as integral part of out lives. Yes, teaching, as any other job, has its pluses and minuses. But this is us who can change it for the better. The only thing we need to do is to change ourselves – be more active, resourceful, energetic and optimistic. We shouldn’t forget to make plans for the future and socialize with other teachers. We need to find time for both professional and personal development. We should be open-minded, curious and playful at times. And what is more, we need to stay alert (or awaken) both in our lives and our classrooms.